The global medical device technologies market is largely steered by global players, of which a few that are involved in the manufacture of in vitro diagnostic devices hold the leading share. However, small players, predominantly from emerging economies, seeking entry into the market will alter the scenario in the coming years. The evolution of medical device technologies have led to breakthroughs in disease diagnosis and in treatment of diseases. Medical technologies have brought about efficacy, sustainability, and efficiency in healthcare systems with hi-tech devices such as ultrasounds, continuous glucose monitoring systems, and many more. These are some of the key growth drivers of the medical device technologies market. On the flip side, serving as a hindrance to the market is rising incidence of use of non-licensed technology for the integration of biomedical devices. A report by Transparency Market Research projects the global medical device technologies market to rise at a CAGR of 4.6% between 2017 and 2025 for the market to attain a value of US$563,886.5 mn by 2025 increasing from US$377,562.4 mn in 2016. The global medical device technologies market has been studied in terms of device type, end-user, and region. The segments of the market depending upon device type are in vitro diagnostics devices, diagnostic imaging devices, cardiology devices, ophthalmology devices, orthopedic devices, endoscopy devices, diabetes care devices, wound management devices, anesthesia and respiratory care devices, kidney/dialysis devices, and other devices. The others segment comprises hospital supply devices, dental devices, and drug delivery systems. In vitro devices and other devices led the global medical device technologies market in 2016 revenue-wise. The segment of in vitro diagnostic devices is expected to display notable growth in the coming years too because of rising incidence of infectious diseases along with the rising popularity of non-invasive diagnostic practices. The others devices segment is also expected to have a significant bearing on the development of medical device technologies market owing to the adoption of advanced technologies for the manufacture of devices such as dental implants. On the basis of end-user, the market is classified into six segments, namely academics and research, hospitals, clinics, diagnostic centers, ambulatory surgical centers, and others. Hospitals and academics and research are presently the leading end-use segments of medical device technologies market. In 2016, hospitals held the leading share of the overall market owing to proliferation in the number of hospitals and government backing in many countries for improvement of the healthcare sector. The key regional segments of the global medical device technologies market are North America, Europe, Asia Pacific, the Middle East and Africa, and Latin America. North America led the market in 2015 among other key regional segments because of rising incidence of cancer, metabolic diseases, and a large patient pool of individuals with chronic diseases and cardiovascular diseases that require crucial diagnosis and therapies. The demand for automated medical processes and the region being home to several manufacturers are also contributing immensely to the North America medical device technologies market. Europe trailed North America in the global medical device technologies market in 2016 revenue-wise. In vitro diagnostic devices are majorly fuelling the growth of this regional market on account of high prevalence of cancer, stroke, and cardiovascular diseases. Some of the key players operating in the global medical device technologies market are Abbott Laboratories, Boston Scientific Corporation, Baxter International Inc., Medtronic plc, Cardinal Health Inc., F. Hoffmann-La Roche Ltd., GE Healthcare, Johnson & Johnson, Siemens Healthineers, Smith & Nephew plc, Stryker Corporation, and Koninklijke Philips N.V. This report on the global medical device technologies market analyzes the current and future prospects of the market. The report comprises an elaborate executive summary, including a market snapshot that provides overall information of various segments and sub-segments. Market revenue in terms of US$ Mn for the period between 2015 and 2025 along with the compound annual growth rate (CAGR %) from 2017 to 2025 are provided for all the segments, considering 2015 as the base year. Market size estimations involved in-depth study of services and product features of different types of services. Additionally, market related factors such as increase in prevalence of cancer and rare diseases, rise in demand for regenerative and cell-based therapies and historical year-on-year growth have been taken into consideration while estimating the market size. The research is a combination of primary and secondary research. Primary research formed the bulk of our research efforts along with information collected from telephonic interviews and interactions via e-mails. Secondary research involved study of company websites, annual reports, press releases, stock analysis presentations, and various international and national databases. The report provides market size in terms of US$ Mn for each segment for the period from 2015 to 2025, considering the macro and micro environmental factors. Growth rates for each segment within the global Medical device technologies market have been determined after a thorough analysis of past trends, demographics, future trends, technological developments, and regulatory requirements. A detailed qualitative analysis of factors responsible for driving and restraining market growth and future opportunities has been provided in the market overview section. This section of the report also includes market attractiveness analysis that provides a thorough analysis of the overall competitive scenario in the global medical device technologies market. 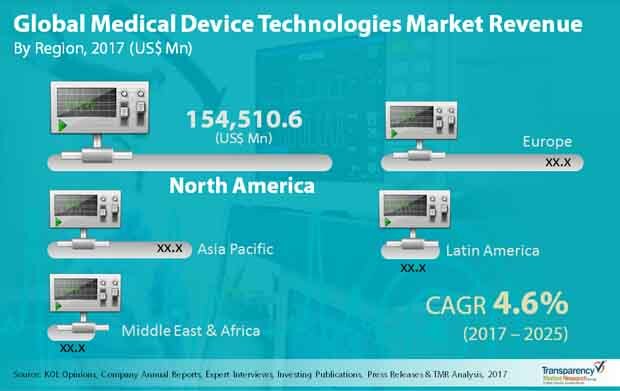 The medical device technologies market has segmented into three categories, namely by device by end-user and by region. Geographically, the global Medical device technologies market has been segmented into five regions: North America, Europe, Asia Pacific, Latin America, and Middle East & Africa. In addition, the regions have been further segmented by major countries from each region. These include the U.S., Canada, the U.K., Germany, France, Italy, Spain, China, Japan, India, Saudi Arabia, UAE, Brazil, and Mexico. The report also profiles major players in the medical device technologies market based on various attributes such as company overview, financial overview, SWOT analysis, key business strategies, product portfolio, and recent developments. Key companies profiled in the report include as Abbott Laboratories, Boston Scientific Corporation, Baxter International, Inc. Medtronic plc, Cardinal Health Inc., F. Hoffmann-La Roche Ltd., GE Healthcare, Johnson & Johnson, Siemens Healthineers, Smith & Nephew plc, Stryker Corporation, Koninklijke Philips N.V., and other prominent players.